Much goes into the planning and design of a vehicle to make it appealing for the masses to want to buy. These design features are often a blend of aesthetic and convenience. 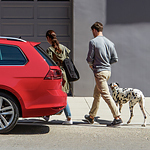 The 2018 Volkswagen Golf SportWagen includes a number of features that should make driving throughout Medford highly enjoyable. The design features of the 2018 Golf SportWagen include things that drivers can appreciate. A panoramic sunroof that allows for an amazing view of the day and night sky is a great feature to have. When you add in the fact that this sunroof both tilts and slides open, you have a feature that drastically increases the fun factor of driving the Golf SportWagen. Another feature of the Golf SportWagen the drivers will like is the LED daytime running lights. With their sleek design, these lights give this vehicle a distinctive look that is sure to turn heads after you drive it off the lot at Lithia Medford Volkswagen.